Apple 4K TV recommends it's Belkin ultra fast cable. If Apple 4K recommended jumping off a cliff, would you? Do ignore the angry negativity, it’s no wonder this community feels less and less relevant. You should try it, you’ll feel better afterwards. I was sceptical about the Belkin cable at first. improvement). B & O must have secured a sufficiently large amount of money Lot C7 to continue into next year. So to summarise, this year's and next year's Eclipse will use last year's panels - excellent, that should help boost sales! I am also in trouble with that lack of upgrade. I am indeed a B&O lover, but buying a screen which replacement has been replaced will be hard to accept. i fear this info is true, even if I am afraid it is not. The Belkin high speed cable is actually capable of delivering high speed which is necessary for HDR when watching 4KUHD content. When a HDR format is active, the sampling rate for colour and luminance signal is the same (4:4:4), and the bandwidth requirement is 18 GB/s. It can deliver speeds up to 48GB/s. A lot of the cables on the market are only High Speed 10 GB/s, and these cables will not work for 4K UHD when HDR is activated, or the frame rate is 50/60 fps. The Belkin cable has been tested by B&O and it is recommended to use as a reference cable. Not as elegant integration as with a Beovision, but you can. Actually you’ll, more or less, only be missing out on the BR1. I still prefer Loewe’s menu system - it’s more Beo-ish. I wonder if Loewe are getting the latest panels ...and Sony as well maybe ? If this was really so, there would be little reason to buy an Eclipse. As for the dongle - I am not aware that it is on the market. If you know where to buy it, please tell us! And I am not sure either that LG made it - originally it was used in Struer for test reasons a couple of years ago. .....the right cables or the WiSA Transmitter/the S8 hub solution would do the job. ....and of course the simplicity of controlling all with one remote, the BROne. But when paying premium I would expect the latest panel regardless. To be fair - and if we can be fair - I'm pretty confident B&O had to commit to a minimum number of "panels" from LG as part of this deal. Lest we forget one important fact: these aren't off-the-shelf panels, either. LG has produced a special casing for them to slot in to the soundbar. This requires manufacturing tools and a minimum order quantity. So when we talk, rather too casually in my eyes, about a 'panel', it's far from some off-the-shelf piece. I am sorry MM but the advantages on a tv versus a beovision getting slimmer by the day. Integration? What integration, I need an atlona switch for distribution on picture, early days just a cable and a simple box. A core can easily share speakers with multiple solutions the oneremote or almando. The only thing is my BLGW where I cannot fully use it but I am confident with a lintronic box I will get it as with the BR1. Sorry I give you the 9 channel amplifier, which is good and I need something for my 7 beolabs in the living. However I should buy this every 10 years, not every 3. Hence one of the main reasons why I am still limping on getting an Eclipse or not. I know a bit about the differences as i own both an Eclipse AND an LG C7, and just for the sake of the debate, i am very happy with my Eclipse. Perhaps the WISA stick is only available in the US market still. LG has made a USB stick you can plug into your OLED screen, and that way make it WISA compatible. LG Innotek USB Tranmsitter. - Download product brief Her. support HDMI 2.1 — older HDMI versions will not support eARC. Good reason not to update LG panels now. If this is entirely true then it is daftness beyond imagine! I know that the back panel is different, either to hide whatever is behind it or else merely to tidy up the rear of the TV. To throw away the standard rear cover and replace it with a new one is fine if needs must, but to make mechanical changes to the basic TV chassis and therefore make it unique to LG is ludicrous, especially given that same chassis (as far as anyone can tell) is all but "stock" in all performance-related respects. Software changes (if indeed there are any) should have been "flashable" from a standard C7 TV. New rear panel replaces standard and old one discarded. At least, in the above scenario, the excess orders of standard TV's could have been off-loaded through other retail channels as standard LG TVs. eARC is supported on HDMI 2.0b, I believe. 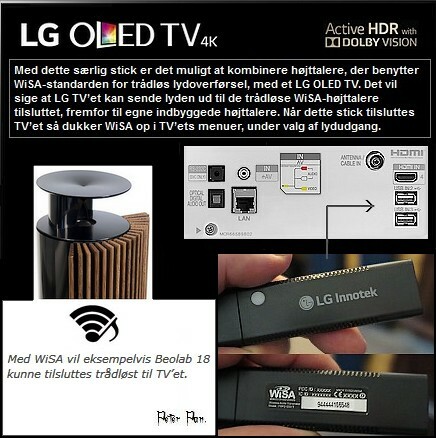 Wow... Is the LG Innotek USB stick already available in Europe ?. Please let me know as I would like to buy BL 18 speakers for my son’s LG C7 OLED. That set up will be just fine without the B&O Sound Center. Hmm has anyone tried if the Wisa adapter will work with the Beosound Core? Seems like a simpler solution than a Transmitter 1 if the goal is only to connect two speakers in stereo. There is a lot of software changes, the settings menu, how it turn off and its own adaptive light control. And a standard back panel would not work, as your cannot hide the cables, as your can with the Eclipse, and not being able to do that, is not very B&O. Also the plastic grill behind it, matches B&O speakers. I know we talk a lot about the similarities, but I would say that a SONY Oled compared to a LG OLED, is much more comparable then a B&O Oled to a LG Oled. If this is entirely true then it is daftness beyond imagine! Not really? You need a seamless way to drop in a panel in to the soundbar to make it look like a B&O TV. You can't just take a C7 and plonk it in a 'soundbar' and then charge £10K. Of course, B&O might have been better producing a standalone soundbar, but whatever they did, it still wouldn't have looked like an elegant design - every TV is different. Even the Sony X1 is a custom OLED panel. The issue with B&O is simply this: they don't sell enough TVs. They might have committed to 2000 LG panels with the custom case and it's just taken far longer to shift the current stock. Whereas the Sony X1 probably sells this monthly, worldwide. I don't believe that could not have been done using standard fixings behind a new rear (plastic) cover! I've said before, I'm suspicious about how many of these menus are HDMI overlays applied in the sound bar, including the light sensor. If this is indeed software within the panel, why on earth would you do it in a way that wasn't flashable from a standard tv? I've been an engineer for over 35years and I can honestly tell you that common sense is priceless and yet so many bright young things are completely devoid! I've mentioned the replaceable back cover, as a tidy-upper behind the t.v. you decide if the mould tool is worth the outlay. Ambient light sensor is a standard feature of the LG C7. There is no B&O picture processing in the Eclipse. The sensor is in the Soundcenter, so it is not the same. I do not know if you have tried the settings menu in the Eclipse, but it is defiantly not a overlay, and there is a bunch of other features that a not in stock LG. If B&O would have made overlay menu, it would work as bad as a MARANTZ receiver and so on. The Eclipse feels like a complete tv, not two component put together. See my point about anything extra being anything other than a software update over a standard c7. I mentioned the problem with the productions numbers in another thread. i did never understand that B&O didn't make different "lines" with the same panels (inclusive an entry line). One panel , the same possibilities and technik in different materials and sound options. Alone with their great stands even a "cheap" B&O would have been profitable. Systems are going to be increased - more, let's say, beolab 17 would have been sold. In my eyes it was a failure to think, that many people buy an 40" B&O, if they pay the same for a 55" Loewe (i even don't mention the yearly price rductions of the "big players").B&O has lost the middle class and this class was responsible for the number of pieces. Now they are very exclusive with all disadvantages. So how are you so sure the ambient light compensation is not applied to the HDMI stream? Hmm. that is a good question as they are only connected with HDMI, so It have too. But regardless of that, I will bet that the generel software is stored on the TV. But okay I am no expert, have you seen a walkthrough of the menu of the Eclipse? 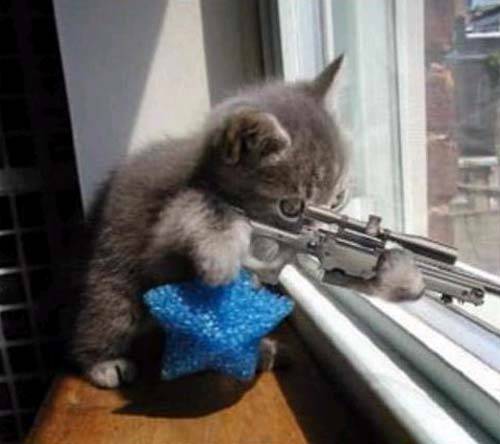 if you can see something I can't please in light me, I am interested in knowing the truth. Or I could test it, if I pull the HDMI out, and the menu is still there? My point was that (if it isnt already) it could have been done that way. Sure it is on a side note in this thread (which is about the Eclipse). 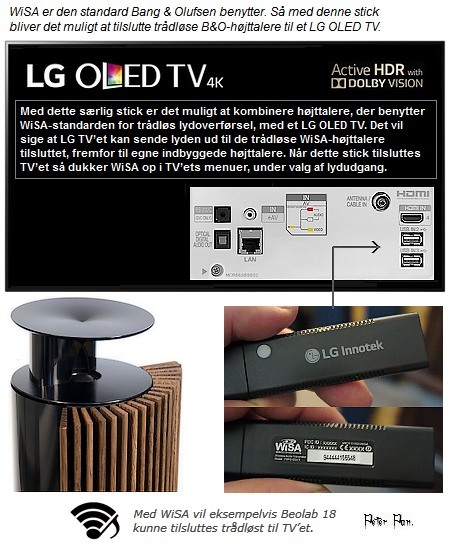 But apart from the stick being used 3-4 years ago with some test LG tv’s in Struer, there has not been much talk about this solution. Before anyone creates false hopes for someone, he should tell us where to get these dongles and how to use them. P.S. At the time of testing in Struer some dongles were sold along with the test LG C6 (if I remember well). Furthermore a special sw version for the speakers (BL18 etc) was required for the dongle to work. I agree it’s a dead end trying to buy one. I just figured it was readily available, given it was on CES 2018.